Ascending Butterfly: Thinking of something warm and fuzzy for Christmas? Furbaby Anyone? Thinking of something warm and fuzzy for Christmas? Furbaby Anyone? Do you remember back to when you first bugged your parents about getting you a pet? Was it during Christmas-time? Was it a cat? dog? bird? reptile? I have always been a dog lover, and despite being an apartment dweller I have always had a love for big breed dogs. My last 'furbaby' was a female Rottweiler and I miss her greatly. She was so big that despite the fact she was super friendly little kids would always get intimidated by her size. She was loving, friendly and an all around goof ball, but could definitely go into 'protection' mode when she felt her family was being threatened. She passed away, and this year I find myself so nostalgic for her. I've been thinking about getting another four legged, furry addition to the family again, but this time around, I'd probably do things a bit differently. I've had quite a number and quite a wide variety of pets throughout the years (dogs, cat, birds, fish, python (yes you read that right, long story), and all of them sort of found me (except for the fish of course), this year I'm researching the idea of a rescue. There are so many dogs, cats, puppies and kittens in Shelters looking for a good home. That's where The Shelter Pet Project comes in. I absolutely love their Tagline 'A person is the best thing to happen to a shelter pet' (isn't that cute? and we all know that it's the opposite that turns out to be true! Pets always turn out to be the best thing that happened to us!). They have a pet finder on their site, and a button allowing you to select dog or cat, once you enter your zip and pet preference and hit search a results page appears with thumbnails and info about each animal. I put in my zip and selected dog as the pet choice and a really interesting mix of breeds appeared for me to choose from. In fact I got so lost reading about each dog's personality, I almost forgot to come back here! I remember years ago when the movie 101 Dalmations came out and people rushed to get Dalmation puppies, and many of them wound up back in shelters. The most important thing to know before you go into a pet adoption is that each breed has it's particular health issues, some are better suited to families with children than others and you really should research and have in mind at least a type of breed that will suit your family and your lifestyle. As I don't have kids, I will probably still go for a large breed, which are a bit rougher to walk until you train them. 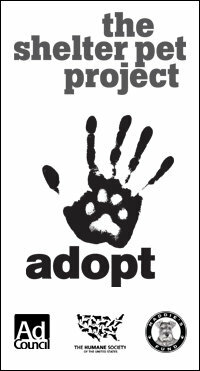 Let's help to keep pet adoption on the rise and shelter deaths on the decline! FTC Disclosure Info: I was selected for this campaign by Latina Bloggers Connect. All opinions are my own.